It’s Gold Ball week in Maine. Here are some story lines to follow for this weekend’s four state championship football games. Both teams feature star offensive producers who get it done in different ways. 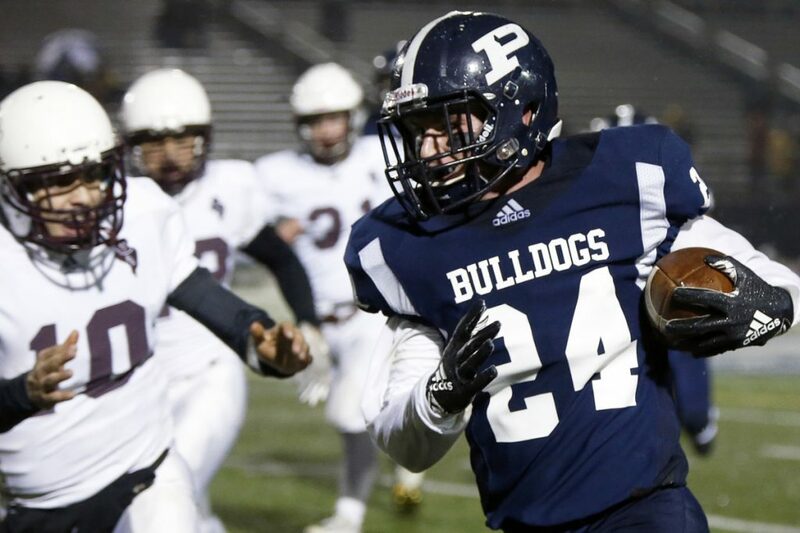 Portland’s Zack Elowitch piles up carries (213), yards (1,713) and touchdowns (19) and is coming off a 232-yard effort (on 29 carries) in Portland’s overtime win against Oxford Hills in the North final. Thornton slot back Anthony Bracamonte is a big-play threat as a runner, receiver and returner (1,844 all-purpose yards, 23 total touchdowns) and he took over Thornton’s regional final win against Scarborough on Saturday with 300 yards and three touchdowns on the ground, plus an 82-yard kick return for a touchdown. But the key in this game is going to be up front, particularly which of the defensive lines can cause the havoc and gain the most control. Portland’s front, led by Nathan Kaponga (16 sacks) and Jonah Green, is an athletic, veteran group. Even in the Bulldogs’ one loss to Bonny Eagle, they produced 16 tackles for loss. Thornton’s defense has given up a few big plays down the stretch as it’s faced better competition but linebackers Ean Patry and Cole Paulin run well and stuff holes, and senior Tommy Palmer is an explosive down lineman with 11.5 sacks. Portland and Thornton have not played since the 2015 state title game, which Thornton won, 24-14. That was the Golden Trojans’ second straight title and last championship appearance. Portland is making its third appearance in the championship game in four seasons, also losing to Bonny Eagle in 2016. Both teams are playing in their fourth state title game in five seasons. Marshwood has won in each of its previous three trips – including beating Brunswick in 2014 and 2015 – and are the defending champions. Brunswick won in 2016. The Dragons – who want to be a ground-and-pound team – are likely to have a hard time matching up with Marshwood’s defensive front that features returning senior starters Adam Doyon and Drew Gregor, as well as athletic junior Connor Caverly off the edge. The Hawks allowed just 70 rushing yards against unbeaten Kennebunk in the regional final. Conversely, Marshwood was able to rack up 211 rushing yards against Kennebunk’s very good defense, as the offensive line of Doyon, Gregor, Spencer Hammond, Ian Dures, and Michael Cruz opened up ever-widening running lanes. In the regional semifinal against Falmouth, Marshwood rushed for over 500 yards in the first three quarters. This should be renamed the Feel Good Bowl. Both teams are making their first appearance in a state championship. Nokomis’ varsity program started in 2007. Its 13 seniors remember back-to-back 0-8 seasons as freshmen and sophomores. Fryeburg has had steady progress. Its senior group won a playoff game the past two seasons before being bounced by the eventual regional champ. The Raiders can claim the 1963 Class C title and a share of the 1965 Class B crown in the days before the MPA tournament. Nokomis avenged regular-season losses by shocking top-seed MCI 13-0 in the regional semifinals and then beating No. 2 Hermon, 13-6. Its defense, led by Quinton Richards (97 tackles, 10 for loss), has allowed 12 playoff points. Fryeburg has also played exceptional defense. After a now-hard-to-fathom opening day loss to Class D Lisbon, Fryeburg has allowed 59 points in its 10 wins. Wells beat Foxcroft, 48-0, in the 2017 title game and is riding a 27-game win streak that includes the 2016 Class C championship. The Warriors appear to be peaking. A midseason offensive reshuffling put Matt Sherburne at quarterback and Payton MacKay at fullback. Tyler Bridge (2,132 yards, 37 touchdowns on the ground) is still threat No. 1, but MacKay has rushed for 465 yards and seven TDs of 27 or more yards in the past two games. The changes also help the defense. Defensive tackle Braeden MacNeill (the former QB), linebacker Jonah Potter, and defensive end Matt Tufts are getting more rest. Potter and Tufts, both quality runners, were splitting time at fullback. The Ponies also have a multipronged rushing attack. They rushed for 368 yards in their 43-28 regional final win Saturday against Bucksport. QB Matt Spooner led the way with 139 yards and two scores. Michaleb Niles worked the inside for nearly 100 yards and Logan Martin and Jeremy Richard were also factors. Since the return of the four-class alignment in 2013, the North has won 4 of 5 title games played at the University of Maine. 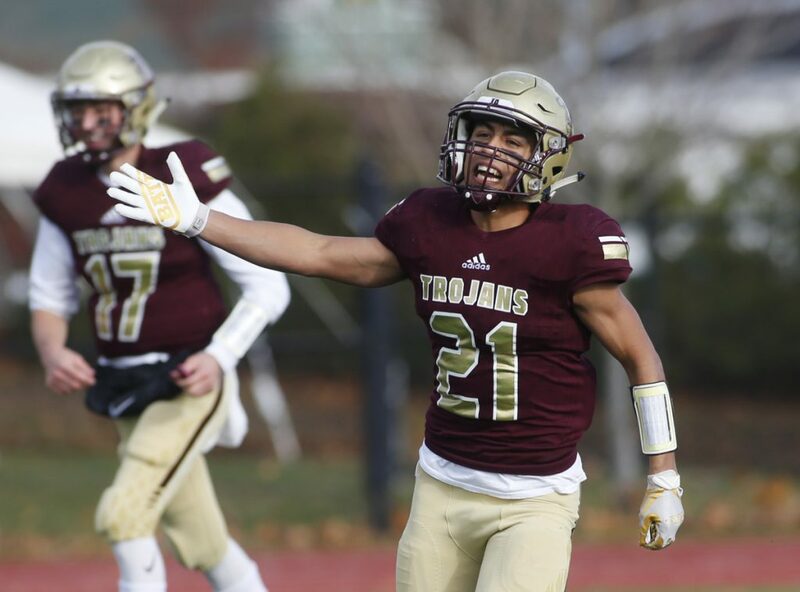 UPDATE: This story was corrected on Nov. 13 at 3:35 p.m. to show that Thornton Academy’s Tommy Palmer is a senior.